A recent grant from the OHSU Knight Cancer Institute Community Partnership Program has enabled College of Public Health and Human Sciences Assistant Professor Veronica Irvin to work with community partner Albany InReach Services to gain insight in to Latinas’ experiences with the breast screening process. Her research project – “Latinas’ experience with mobile mammography and bilingual navigation services from screen through follow-up care” – was one of 10 to receive funding this year. The $25,000 developmental grant allows Veronica and her team to take an in-depth look at Latinas’ experiences through screening with services that help guide the women during the entire process. “Receiving this funding from the OHSU Knight Cancer Institute will allow us to learn how Latinas’ experience with the health care system changes when they have access to a patient navigator and how perceptions of care change when a mammogram is offered in a mobile clinic rather than a clinic,” she says. 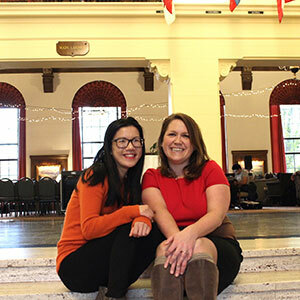 Veronica and InReach Clinic Manager Miao Zhao, a 2016 CPHHS Preceptor Impact Award recipient, are leading the project. The project team also includes OSU doctoral student Alma Torres, undergraduate student Erica Morales Santos and alum Alejandra “Ali” Sanchez, BS ’16, who now works for InReach as a community health care navigator. Rounding out the team are a handful of CPHHS undergraduate students, who are assisting with interviews, coding and analyzing data. During the screening process, Ali served as a health care navigator for the 30 women who received a mammogram screening on a mobile unit. She helped with appointment scheduling and outreach, gave a presentation on breast cancer and provided support throughout the entire care continuum. Alma – who is bilingual – will now meet with underserved Latinas to interview them about their experiences with receiving the mammograms. She will ask them how they heard about the screenings and if they received follow-up care, and talk with them about supporting factors, barriers and comprehension of any education materials that may influence choice and their recommendation of mammography to others. Alma says the team has a big responsibility to understand Latina community values and needs. Miao says partnering with OSU is creating an unprecedented collaboration that will deliver cost-effective solutions that benefit everyone. “I’m amazed at our community’s generosity in helping us expand health services for this underserved population,” she says. The research project is expected to be completed in January 2018.